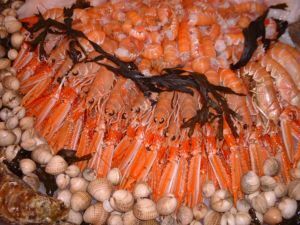 Locally caught fresh raw large whole langoustines (large prawns). Approx 2 per 100g. Seasonal. Also known as raw Scampi or Whole prawn. This is in fact what is inside the rather famous and ubiquitous Whitby Scampi. Great for BBQs or use the tails for a variety of recipes whilst the heads and bodies are great for stocks.